Tesco has reported the worst results in its history with a record statutory pre-tax loss of £6.4bn for the year to the end of February. That compares with annual pre-tax profit of £2.26bn a year earlier. It is the biggest loss suffered by a UK retailer and one of the largest in the country's corporate history. Around £4.7bn of the losses were the result of the fall in property value of its UK stores, 43 of which it said would close earlier this month. The decline in the value of its property portfolio comes as a direct result of falling footfall in many of its out of town superstores. 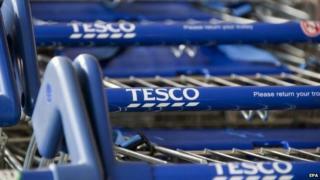 Tesco's chief executive Dave Lewis admitted it had been "a very difficult year for Tesco". 20% of retail space "underused"
He added: "The results we have published today reflect a deterioration in the market and, more significantly, an erosion of our competitiveness over recent years." He said that he expected conditions in the coming financial year to remain challenging. But Mr Lewis said more people were buying more things at Tesco and that this was "an important first step". In the corporate world it's known as "kitchen-sinking" - finding all the bad stuff buried down the back of the sofa, adding it together and announcing a whopping great loss. Today, Tesco became its latest proponent. In fact, to the kitchen sink Dave Lewis, the chief executive, has added the washing machine, the dish washer and the deep fat fryer. The big, hairy, shiver-down the spine number is the revaluation of Tesco's 3,000 UK supermarkets and its stores overseas. With the value of sales down and shoppers turning away from larger out-of-town stores, the business has admitted that its property portfolio simply isn't as valuable as it once believed. Read Kamal's blog in full here. The results cap a tumultuous year for the supermarket giant which is still being investigated by the Serious Fraud Office (SFO) after it overstated its half-year profit forecast in August by £263m. Annual group trading profit, which counts sales through the supermarket's tills was also down 60% at £1.4bn, compared with £3.3bn a year earlier. UK like-for-like sales excluding fuel declined by 3.6% in the year. Marc Kimsey, senior trader at Accendo Markets, described the results as "another shocker" from Tesco. He added: "This set of results disappoints on every level - the pre-tax loss exceeds the City's already dire expectations and the trading profit has fallen by almost 60% in just a year. "Traders are now discounting positive management rhetoric regarding a 'turnaround plan'. Only the numbers will do now and sadly, they are not only disastrous, but deteriorating." Meanwhile, Paul Thomas of the retail consultants Retail Remedy, described the results as not only one of the biggest losses in British corporate history, "it's a black hole that risks consuming a once all-powerful brand". He said: "To say Tesco's chief executive has a mountain to climb to reverse its decline is to underplay the scale of the task. At times the combative Mr Lewis must feel like an ant scaling the Himalayas." Vodafone also reported a £13.5bn pre-tax loss in 2002. The company said the performance of its European stores disappointed as a result of "strong competition from discount retailers" which held back its sales performance, particularly in Ireland which saw a like-for-like sales fall 6.3% in the year. In Asia, Tesco said trading profit was £565m, once currency fluctuations were stripped out, 15.3% lower than a year earlier a result of sales falling in South Korea, Thailand, and Malaysia. Tesco said it had also agreed a plan with the trustees of its pension scheme to pay £270m a year to help mend its £3.89bn pension deficit. And it said it has started a consultation with staff to replace the current defined benefit pension scheme with a cheaper contribution-based pension scheme.